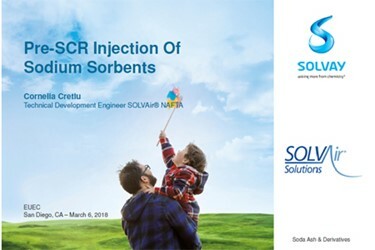 In “Pre-SCR Injection of Sodium Sorbents,” presented at EUEC 2018, trona and sodium bicarbonate treatment of flue gas emissions are reviewed in two case studies. The first focuses on a power plant with a medium sized boiler. In the second case study, the power plant has a large size boiler. The presentation discusses not only how pre-SCR DSI can be used to improve the heat rate of power plants to allow lower “minimum operating conditions when idling”, but also tracks results, including the high removal rate of SOx, improved efficiency, cost savings, and measure of success in each instance. For more in-depth information about sodium bicarbonate, trona, and the industries we serve, check us out at www.solvair.us. Or call us direct at 800.765.8292.